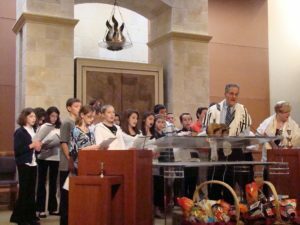 Temple Rodeph Torah is a Reform Jewish congregation with a love of tradition and relevance to our world and our community. We are a unique Jewish community – and a family. We work together to build and maintain a loving home for our congregants. As the Mishnah tells us, the world stands on three things: study, prayer, and acts of love and kindness. We not only believe this at Temple Rodeph Torah, we live it. We have compassion and concern for others. We have a commitment to study. We are forward thinkers – listening to one another, trying new things, working to build and keep connections.